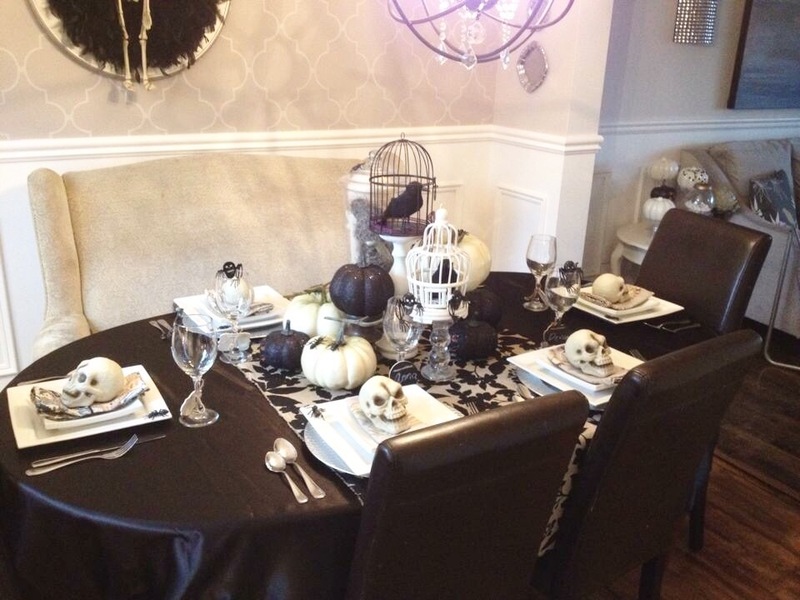 I simply love to decorate for any type of holiday, and Halloween decor is right up there with Christmas (aka The Big One) as far as I’m concerned. 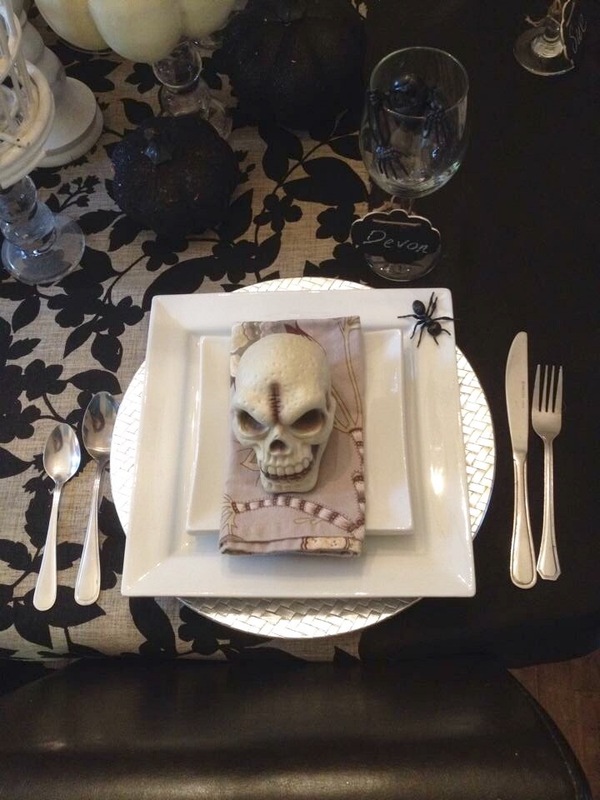 Setting a cool and intriguing tablescape is always on the agenda for any holiday, and this ones creepy and crawly theme won’t disappoint. The skulls bring the creepy, and the spiders and giant ants bring the crawly. I started with a satin black tablecloth. I like to buy my tablecloths when my local fabric store has their bi-annual 40-50% off sale. This saves me a bundle, and the fabric store has a huge array of colours and textures; way more than a store carrying pre-fab tablecloths. After I settled on the black tablecloth, I found this cool burlap fabric with a black leaf pattern. It works perfectly as a table runner. 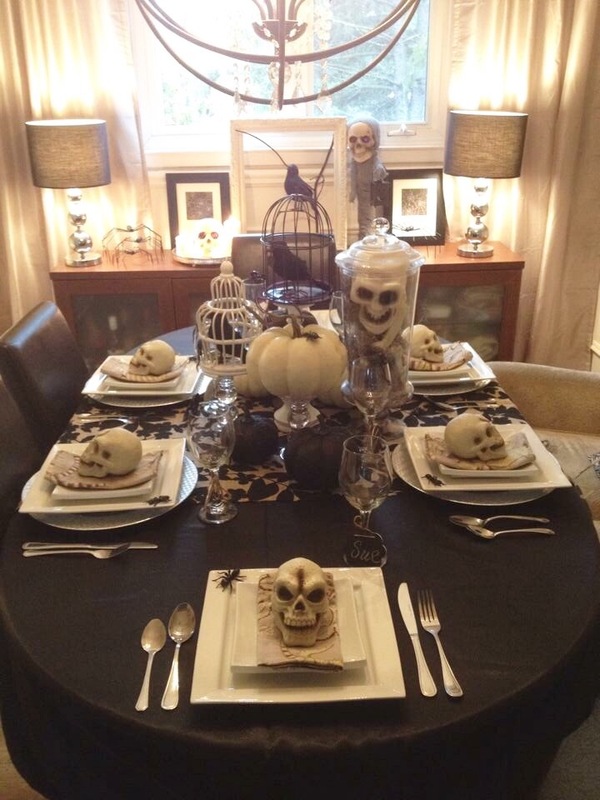 I then stocked the table with cool Halloween accessories, including my two mini birdcages, black and white pumpkins, and skulls for each table setting. I varied the heights of the birdcages to help add some interest. I also found these super cute ants that I added to the white pumpkins. 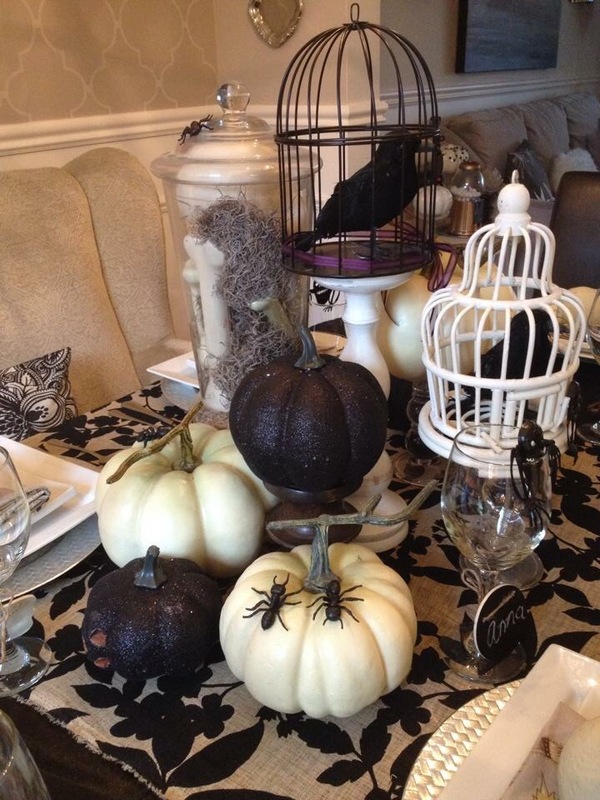 This helps take the pumpkins from thanksgiving decor to creepy and spooky. 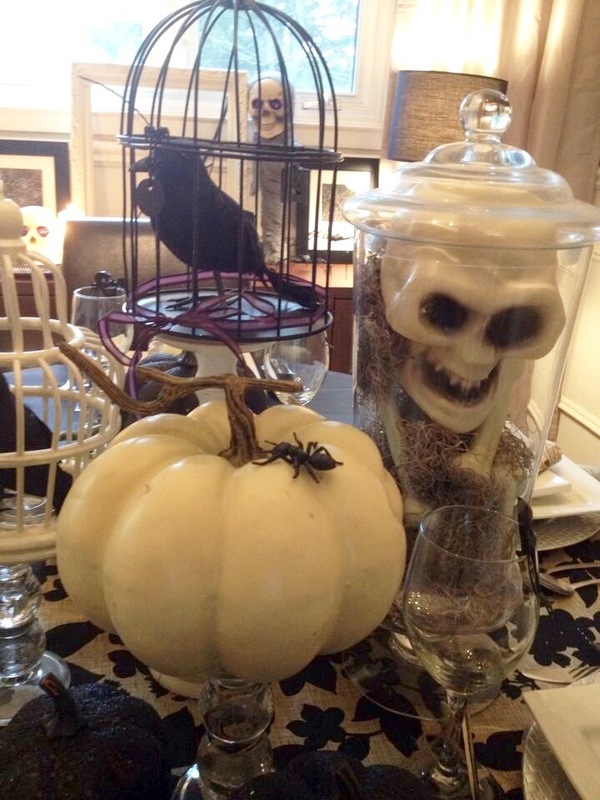 One of my favourite things to decorate with is apothecary jars. They are so versatile and can be filled with so many different items, depending on the holiday. For Halloween, I added some Spanish moss with some plastic bones and a skull I picked up from the dollar store. 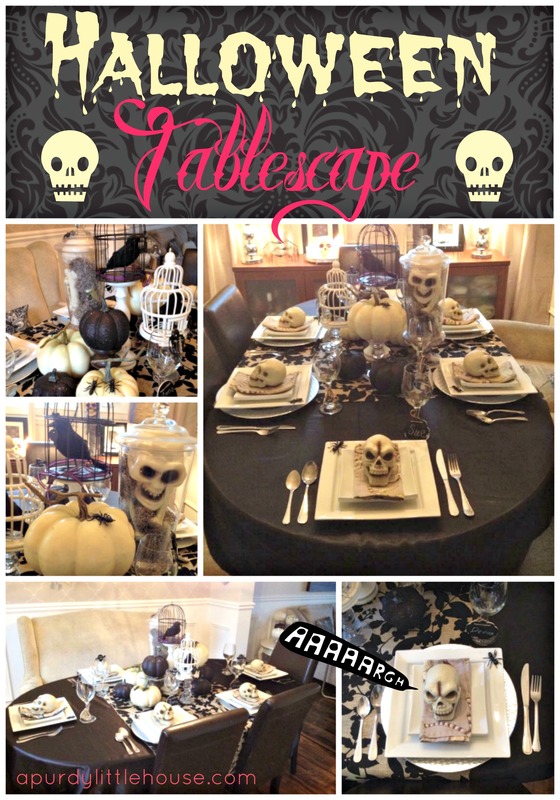 That’s it for my spooktacular Halloween Tablescape. I hope you all have an amazing Halloween tomorrow with friends, neighbours and family. If you’re like me, you’ll have to check a bunch of your kids candy to make sure it’s not poison. Lol. I think they might be on to me…. That’s it for today everyone. 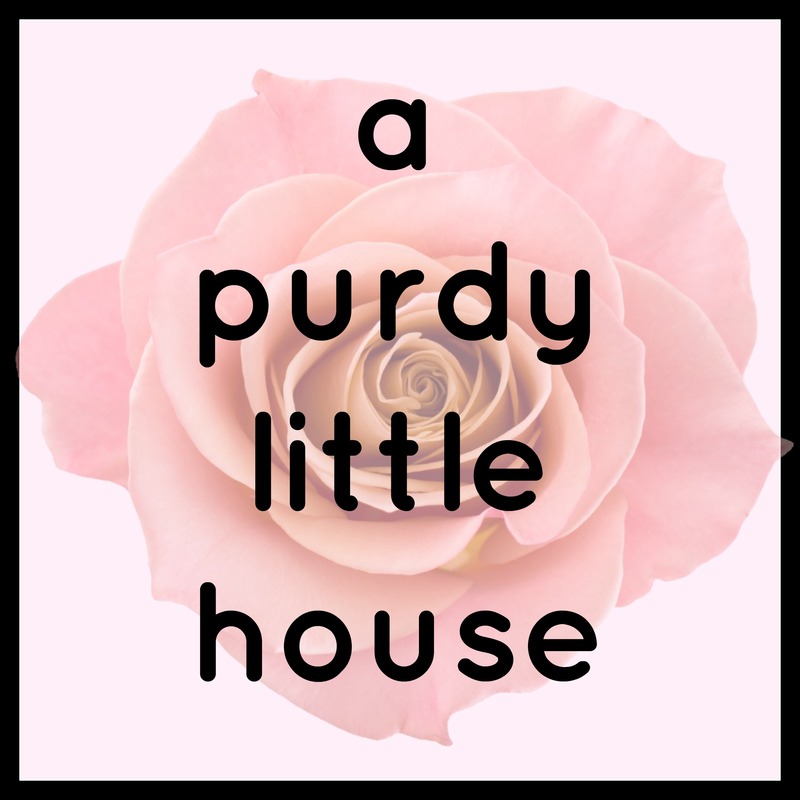 I’ll see you again on Sunday, when I post the round up for the October Room Refresh Challenge for the #30DayFlip. Can’t wait to see what everyone has been working on.